One thing I love about living in the Louisville, Ky., area is the beer scene. Everyone talks about California and Oregon (and they should), but there’s plenty to love in the Bourbon state as well. And I’m not just talking about our excellent brew pubs, either. Exhibit A: Buckhead Mountain Grill. Sure, it looks and feels like a family steakhouse, but the place also has an impressive and massive beer list, with 42 (!) taps pouring local, regional and national brews. Buckhead even has a cool beer app that allows you to sit at your table or bar seat and create your own flight, complete with beer description, alcohol content and IBU. Developed in-house, the app will even recommend beers that are similar to your favorite – on the off chance your favorite isn’t available on draft or in bottles. Schlafly Hop Harvest IPA (5.7 percent ABV, 30 IBU): This is a solid harvest ale with a light malt body made with American hops (Amarillo, Centennial, Mosaic, Simcoe and Magnum). The blend of citrus and pine in both the nose and flavor is its calling card – it actually drinks like a floral and fruity, crisp summer beer. It is actually not a Christmas beer, per se, but rather a celebration of the fall hop-growing season. But hey, what better time than Christmas to enjoy the bounty of that season? Drink this one before your holiday festivities begin, so you won’t get filled up and spoil your dinner. provide different sensations for different people. On the finish, it’s sweet and certainly Christmas-y. Worth a try. Flat 12 Glazed Ham Porter (6.3 percent ABV, 34.1 IBU): Ham? Yep. That’s what it said as I scrolled through the trusty beer app. Hey, my grandma used to make ham just about every Christmas, so this was one I had to try. This beer is smoky, to be sure, and it does hint of the spicy-sweet glaze one would expect to find on a Christmas ham, but never fear – Glazed Ham Porter does not taste like pork. It’s actually quite an interesting beverage, with the assertive smoky sweetness carrying the load. Sure, it doesn’t really taste like ham, but if you’re looking something to drink with your ham this Christmas, this one will fit the bill. Three Floyds Alpha Klaus Porter (6 percent ABV, 38 IBU): Good ol’ Three Floyds Brewing is a few hours’ up the Interstate from Louisville in Munster, Ind., and is the producer of some fine, hoppy beers such as Dreadnaught and Alpha King. 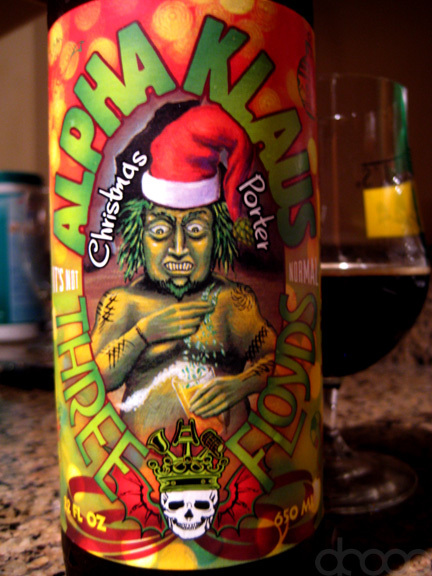 Alpha Klaus Porter is an interesting blend of coffee tones, malts and hops, with a bitterness that seems higher than just 38 IBU. I drank my four-ounce flight pour with one of my friends’ hot wings, and it was quite a treat. Think of this as one you can sip while opening gifts with the kids. 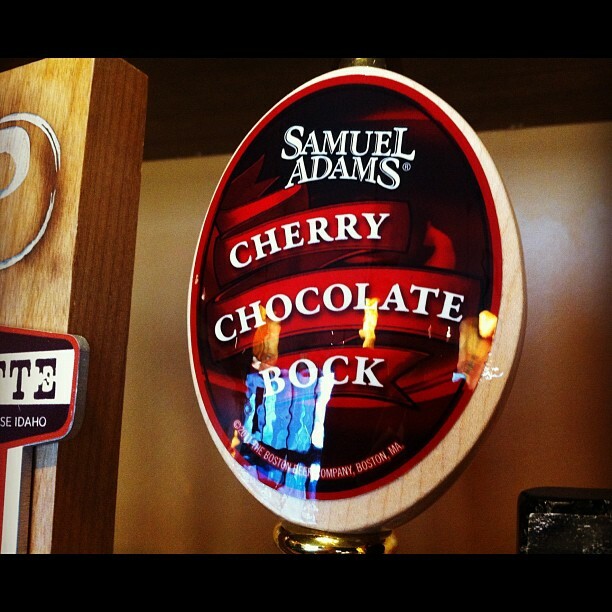 Sam Adams Cherry Chocolate Bock (5.8 percent ABV, 15 IBU): A Christmas tradition in my family was that my dad always gave my mom a box of chocolate covered cherries for Christmas, so this was another one I felt compelled to add to my flight. Made with cocoa nibs and natural cherries, the nose is pretty overwhelming – it borders on cough syrup overwhelming, in fact. The tart cherry taste also overcomes the malts, and the beer finishes sweet. Not my cup of tea, but I bet my mom would like it. Upland Teddy Bear Kisses (10.2 percent ABV, 80 IBU): Upland Brewing is located in Bloomington, Ind., and is well known around the region for its Upland Wheat and Dragonfly IPA. Teddy Bear Kisses is a great big beer – an imperial stout with deep, dark malts and plenty of alpha hops. Interestingly, the nose is rather light, which belies the robust flavor of the beast. It drinks like a dark, imperial IPA, and doesn’t hit the palate as hoppy as the IBUs would suggest. This one is a big, wet, slobbery teddy bear kiss, and I like it. This post was written for and originally published by New York-based AlcoholProfessor.com.